I was able to attend the Thursday drive electric vehicle experience. 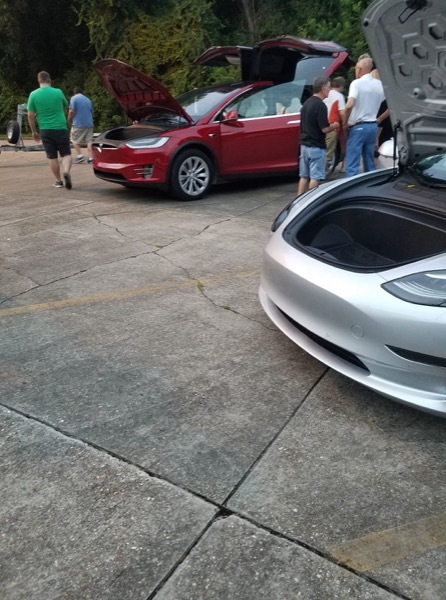 We had a Tesla Model 3 and X, a Chevrolet Bolt, two Nissan Leafs, a Prius Prime, and a battery electric boat (1983 Duffy Electric Launch) turn out for the event. Several people were given rides in Model X, and I gave about six boat rides for several groups, about 12 people total. We may have been the only event in the nation that offered boat rides as part of the EV experience! Participants explore the Tesla Model X and 3, along with several other cars and a boat. Thursday the 13th between 7:15-8:30PM we will hold the EV meet and greet event where you can come check out or bring a high tech EV. We will have an EV charging station demonstration, and a classic EV boat offering free rides on the beautiful Vermilion Bayou at Rotary Point's dock. Registered attendees report 121,000 electric miles driven.